An update released at the same time will also add Splatoon Mii Fighter costumes and a new Wii U Miiverse stage. Very cool news. I'm surprised they didn't wait till the show... interesting move. Lucas will be $3.99 for either the 3DS or Wii U versions, or $4.99 as a bundle for both versions. Well then. $5 for a clone character? Bah. Free stage sounds cool though. Oh, I was mistaken. He's actually 4 bucks per system (3DS/Wii U), or 5 for both systems. Not to be one of "those guys," but clone isn't entirely accurate. His bread-and-butter moves (the A moves) are all different from Ness's, and even his B-moves all have different properties (outside of perhaps PK Magnet). Even his grab is different. He's about as much a clone as Luigi. I'm curious when his amiibo releases. I think Lucas will be the final amiibo that I actively seek out. Gotta have him! I don't care for the character enough to spend $5 on him. I'll totally drop $5 on a character like Ryu though. I still wish they would have done something similar to Mario Kart with the DLC, where $13 nets you a nice couple chunks of DLC over 6 months... but of course I would. That was the best deal in DLC ever! @TriforceBun I guess, but not NEW new like Andy from Advance Wars and such would be. I guess I just had hopes that the Mario Kart DLC reflected Nintendo's general approach to DLC. Perhaps not. I'm sure we'll be getting actually new characters out of the voting thing when that gets finished up. This is just giving us some heavily requested characters that are easier to implement while they're working on the actual new characters, I'd imagine. It's a difference between game genres. In Smash and other fighting games, a single character offers a wealth of content compared to Mario Kart where several stages are needed to offer significant content. I wonder how different he'll be from Mess in this version. Well I hope he's cleaner. This reminds me of a mean boo-boo I made when I was a kid talking about my cousins, Jessica and Melinda. Or as we usually called them, Jess and Mel. One day when referring to them in conversation with my parents, I accidentally (honest!) screwed up (twice! ): I called them Mess and Smell. The truth comes out accidentally sometimes. I think those are awesome nicknames, btw. It's like Flotsam and Jetsam! Lucas has a nice variety of outfits to choose from! 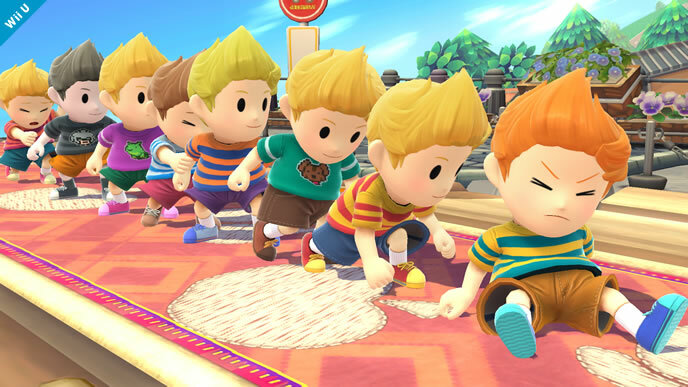 My favorite one here is the brown-haired Lucas that's based off of Duster. @Zero @V_s I wouldn't even be surprised if these two characters were planned and cut from the regular game due to time constraints. It at least sounds like Mewtwo was. That boney shirt! Daww... Makes me want to play Mother 3 again. These are great! I like the Duster one too. Any references in the far back one and the orange/blue though? I kinda wish he had a Ness-style look somewhere. MAJOR Mother 3 spoiler below. Claus in the front there... That pose is on purpose and it fills me with sadness. If you want to really get sad, check out the Lucas reveal trailer again and watch very carefully at a certain point. I can't believe I didnt notice that sooner. They recreated the final battle with Claus. 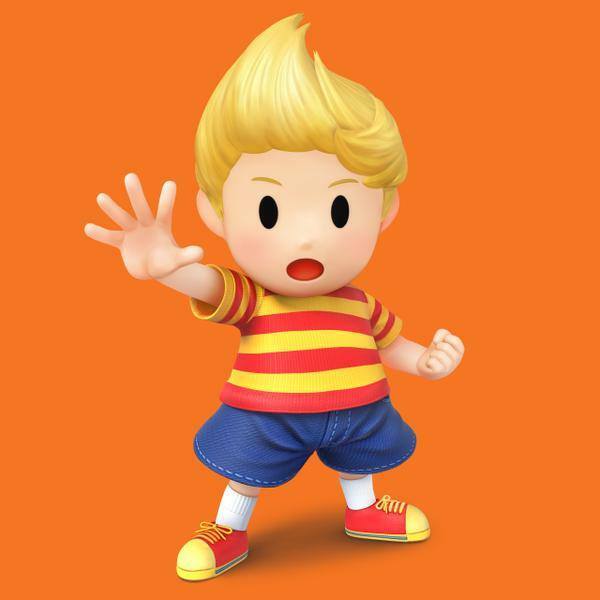 It's a shame there aren't any alternate costumes for Lucas like the one in Project M.
Hey, more of you guys here have played Mother 3 than I expected. We should have a discussion thread for that gem of an RPG. Also, nobody highlight anything in this thread unless you've beaten Mother 3! I edited my spoiler warning to say MAJOR spoiler now. Don't want to ruin anything for anyone! And yeah, I actually flip-flop over which I like better, Earthbound or Mother 3. Regardless, they're both very special. @Pokefreak911 I... don't see the logic there. In fact I probably value a single new track in MK more than a single new character in Smash. Hm, I don't really agree, personally. But I think it's a pretty fair comparison. That said, adding a character in Smash is actually harder than adding a track in MK, hence the price. With tracks in MK, you really just need to...well, make a new track. With a character, you have to make sure he's balanced with every other character in the game, making sure his moves "mix" well with other characters and don't freak everything out, making sure there's no weird exploits that arise, etc. Sakurai said it was more akin to multiplication than addition, and I think adding new stages and tracks in MK would be similar to the latter. In other news, Smash Bros video with new content coming from Nintendo! It releases right before the Lucas DLC, at 7:40 AM PST on 6/14. I love that Smash is now a thing that continues to evolve over the course of the generation. I'm hoping that more and more characters, stages, and features will come for the next few years. Looking forward to this presentation almost as much as Nintendo's actual E3 Direct.